ASTANA (KazInform) — Representatives of the Astana International Financial Centre participated in the Caspian Week conference at the World Economic Forum in Davos, Switzerland, KazInform cites AIFC’s press service. The Governor of the Astana International Financial Centre (AIFC) Kairat Kelimbetov participated in the Caspian Week conference within the framework of the World Economic Forum (WEF). Caspian Week is a meeting point for visionaries, market leaders, and experts to exchange opinions. This year the event’s focus is to elaborate commercial opportunities that new digital technologies can bring to the trade and logistics value chain. The objectives of the AIFC are to attract investment into Kazakhstan’s economy through the establishment of an attractive environment for investment in the financial services, to develop local capital markets, to ensure their integration with the international capital market, and to develop markets for insurance and banking services and for Islamic financing in the Republic of Kazakhstan. 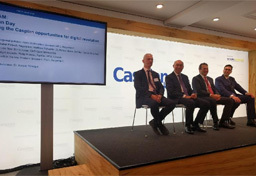 At Davos, the panelists discussed issues of regional policies on the introduction of new technologies in state and commercial projects, development of financial technologies, as well as state support and international cooperation in this area. “Promoting financial technologies and creating an ecosystem that allows them to advance is one of the strategic directions for the AIFC’s development. AIFC Fintech Hub has started to operate and should become a meeting point for key players of ecosystem and innovations’, Mr. Kelimbetov said. At present, AIFC has several projects in financial technologies that have already been launched along with partners: Acceleration Program for FinTech and e-commerce, AIFC FinTech Regulatory Sandbox, Blockchain Research Centre, and Cashless society initiatives.